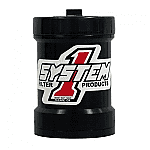 Created by Steve Faria more than 15 years ago, System 1’s complete line of heavy duty and industrial filters has traveled from Tulare, Calif., the heart of the Central Valley, across the globe. System 1 products have been extensively tested in the world’s most demanding environments and used successfully in the racing circuits of NASCAR, Busch Series, NHRA, CART, IRL, Formula 1, World of Outlaws, International Hot Boat Association, Monster Trucks, Off Road and numerous other racing applications. System 1 products are proudly made in the USA and are available at Kenworth and Peterbuilt stores.